MRL Ltd.´s Auricularia auricula powder contains both mycelium and primordia (young fruit body) cultivated into a biomass that is grown on a sterilised (autoclaved) substrate. This cultivation process ensures the powder is free from contamination by other fungi and that pesticides and heavy metals are absent. The cultivation system is proprietary, allowing for standardised production of Auricularia auricula. The powder biomass is then sealed in plastic containers. The Auricularia-MRL biomass contains mycelium and primordia (young fruiting body) of the respective mushroom. In comparison to Auricularia extracts, biomass has the advantage of no unwanted shift of effect which happens with extracts or concentrates, including lyophilisation, and thus the activity of the product corresponds with the source mushroom, while being further intensified by utilizing the entire mycelium. 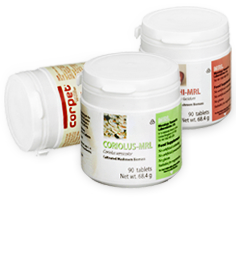 Mycelium biomass of mushrooms offers a mixture of many co-operating and co-related healthful bioavailable ingredients prepared by nature itself – it is thus a truly pure natural product. Mushrooms spend more than 90% of their life cycle in the mycelium. Since mushrooms cannot produce their own energy through photosynthesis, the mycelium must be able to actively obtain or produce extracellular compounds and metabolites that promote the longevity and vitality of the living mushroom. These properties lie behind the high enzymatic activity of the mycelium, which stays preserved in the carefully processed MRL products. The Auricularia auricula is processed under the same rigorously controlled conditions that are applied to the manufacture of a conventional pharmaceutical. This ensures that each tablet contains 500 mg of the standardised Auricularia product. The fungal biomass Auricularia auricula that comprises Auricularia-MRL is certified 100% Organic in the United States by Quality Assurance International (Certificate No. 103491-A). In December of 2005, MRL powder gained EU organic certification in accordance with EU Council Regulation (EEC) No. 2092/91 by Quality Assurance International (Certificate No. 105493-A). *This statement has not been evaluated by the Food and Drug Adminstration. The product is not intended to diagnose, treat, cure or prevent any disease.